Walk into cafe. Go to order coffee. 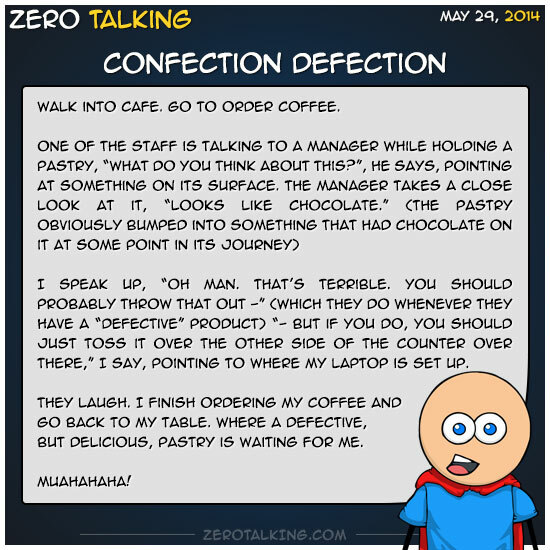 One of the staff is talking to a manager while holding a pastry, “What do you think about this?”, he says, pointing at something on its surface. “– but if you do, you should just toss it over the other side of the counter over there,” I say, pointing to where my laptop is set up. I finish ordering my coffee and go back to my table. Where a defective, but delicious, pastry is waiting for me.